Ants are insects of the family Formicidae. They, along with the related families of wasps and bees, belong to the order Hymenoptera. Ants are one of the world's most successful and diverse animal families, with more than 12,000 species. They are eusocial and known for their highly organized colonies and nests, which sometimes consist of millions of individuals. Individuals are divided into sub-fertile, and more commonly sterile, females ("workers"), fertile males ("drones"), and fertile females ("queens"). Colonies can occupy and use a wide area of land to support themselves. Ant colonies sometimes are described as superorganisms because the colony appears to operate as a unified entity. Ants are found on almost every landmass on Earth. The only places lacking indigenous ant species are Antarctica, Greenland, Iceland, parts of Polynesia, the Hawaiian Islands, and some other remote islands. When all their individual contributions are added up, they may constitute up to 15 to 25 percent of the total terrestrial animal biomass (Jones 2007; Krushelnycky 2005; Schultz 2000). Although viewed as pests by many people, ants play a tremendously important role in the earth's natural ecosystems. They recycle dead plants and animals, enrich the soil, pollinate flowers, spread seeds, and are a major food source for many animals, among other contributions. Beyond these ecological values, humans benefit in many ways, including in the role of ants in keeping potentially harmful insects, such as termites and agricultural pests, under control. In some cultures, ants are used as food and ingredients in traditional medicines, and army ants (with their powerful mandibles) are even used as emergency sutures for wounds. Ants' numerous symbiotic relationships with plants and thousands of species of arthropods (insects, spiders, mites, etc.) reflects on the harmony of nature, and ants' unique and often fascinating behaviors adds to the human wonder of nature. This closeup shows the prominent mandibles and the comparatively small compound eyes. Ants are distinguished from other insects by the following traits: elbowed antennae; the presence of a metapleural gland; a strongly constricted second abdominal segment forming a distinct node-like petiole; and a narrow waist between their mesosoma (thorax plus the first abdominal segment, which is fused to it) and gaster (abdomen less the abdominal segments in the petiole). The petiole can be formed by one or two nodes (only the second, or the second and third abdominal segments can form it). Ant bodies, like those of other insects, have an exoskeleton, meaning their bodies are externally covered in a protective casing, as opposed to the internal skeletal framework of humans and other vertebrates. Ants do not have lungs. Oxygen passes through tiny valves, the spiracles, in their exoskeleton—the same holes through which carbon dioxide leaves their body. They have a primitive heart and their blood is colorless, rather than red. Their nervous system is much like a human spinal cord in that it is a continuous cord, the ventral nerve cord, from head to rear with branches into each extremity. The three main divisions of the ant body are the head, the thorax, and the metasoma or gaster. The head of an ant has many important parts. Ant eyes include the compound eyes, similar to fly eyes: numerous tiny lenses attached together, which enables them to see movement very well. They also have three small ocelli on the top of the head, which detect light and dark. Most ants have poor to mediocre eyesight; some are blind altogether. A few have exceptional vision though, such as the bulldog ants (Myrmecia species) of Australia. Also attached to the head of an ant are two antennae ("feelers"). The antennae are special organs that help ants detect chemicals, including those used in communication, as well as a sense of touch. Ants release pheromones to communicate with each other and the antennae pick up these chemical signals. The head also has two strong jaws, the mandibles, which are used to carry food, manipulate objects, construct nests, and for defense. In some species, there is also a small pocket inside the mouth to hold food for passing to others. The thorax of the ant is where the six legs are attached. At the end of each leg is a hooked claw that helps ants climb and hang onto things. Most queens and male ants have wings, which they drop after the nuptial flight. The wing scars are then visible, a distinguishing feature of queens. Wingless queens (ergatoids) and males can also occur. The metasoma (the "abdomen") of the ant houses many of the important internal organs. These include the crop, where food is stored for the ant's own use or to bring back to the colony; the stomach, where food is digested for the ant's own use; and the reproductive organs. Many species of ants have poison glands and stingers used for subduing prey and defending their nests. The life of an ant starts with an egg. If the egg is fertilized, the ant will be female (diploid); if not, it will be male (haploid). Ants are holometabolous and develop by complete metamorphosis, passing through larval and pupal stages (with the pupae being exarate) before they become adults. The larval stage is particularly helpless—for instance it lacks legs entirely—and cannot care for itself. The difference between queens and workers (which are both female), and between different castes of workers when they exist, is determined by the feeding in the larval stage. Food is given to the larvae by a process called trophallaxis in which an ant regurgitates food previously held in its crop for communal storage. This is also how adults distribute food among themselves. Larvae and pupae need to be kept at fairly constant temperatures to ensure proper development, and so are often moved around the various brood chambers within the colony. A new worker spends the first few days of its adult life caring for the queen and young. After that, it graduates to digging and other nest work, and then to foraging and defense of the nest. These changes are fairly abrupt and define what are called temporal castes. One theory of why this occurs is because foraging has a high death rate, so ants only participate in it when they are older and closer to death anyway. In a few ants there are also physical castes—workers come in a spectrum of sizes, called minor, median, and major workers, the latter beginning foraging sooner. Often the larger ants will have disproportionately larger heads, and correspondingly stronger mandibles. Such individuals are sometimes called "soldier" ants because their stronger mandibles make them more effective in fighting other creatures, although they are still in fact worker ants and their "duties" typically do not vary greatly from the minor or median workers. In a few species, the median workers have disappeared, creating a sharp divide and clear physical difference between the minors and majors. Myrmecocystus (Honeypot) ants store food to prevent colony famine. Some ants, called honeypot ants, have special workers called repletes who simply store food for the rest of the colony, generally becoming immobile with greatly enlarged abdomens. In hot, dry places, even deserts, in Africa, North America, and Australia where they live, they are considered by some people to be a great delicacy. Most of the common ant species breed in the same way. Only the queen and breeding females have the ability to mate. Contrary to popular belief, some ant nests have multiple queens. The male ants, called drones, along with the breeding females emerge from pupation with wings (although some species, like army ants, do not produce winged queens), and do nothing throughout their life except eat and mate. At this time, all breeding ants, excluding the queen, are carried outside where other colonies of the same species are doing the same. Then, all the winged breeding ants take flight. Mating occurs in flight and the males die shortly afterward. The females that survive land and seek a suitable place to begin a colony. There, they break off their own wings and begin to lay eggs, which they care for. Sperm obtained during their nuptial flight is stored and used to fertilize all future eggs produced. The first workers to hatch are weak and smaller than later workers, but they begin to serve the colony immediately. They enlarge the nest, forage for food, and care for the other eggs. This is how most new colonies start. A few species that have multiple queens can start a new colony as a queen from the old nest takes a number of workers to a new site and founds a colony there. Ant colonies can be long-lived. The queens themselves can live for up to 30 years, while workers live from one to three years. Males, however, are more transitory, surviving only a few weeks (Gordon 1999). Ants living in seasonal climates survive the winter by going into a state of dormancy or inactivity. The forms of inactivity are varied and some temperate species have larvae that go into diapause while in others the adults alone pass the winter in a state of reduced activity (Wilson 1971). All ants, along with termites and some bees and wasps, are eusocial animals. Eusociality is the phenomenon of reproductive specialization found in some animals. It generally involves the production of sterile members of the species, which carry out specialized tasks, effectively caring for the reproductive members. It most commonly manifests in the appearance of individuals within a group whose behavior (and sometimes anatomy) is modified for group defense, including self-sacrifice ("altruism"). Ant communication is accomplished primarily through chemicals called pheromones. Because most ants spend their time in direct contact with the ground, these chemical messages are more developed than in other social insects. So, for instance, when a forager finds food, she will leave a pheromone trail along the ground on her way home. In a short time, other ants will follow this pheromone trail. Home is often located through the use of remembered landmarks and the position of the sun as detected with compound eyes and also by means of special sky polarization-detecting fibers within the eyes (Fukushi 2001). Returning home, they reinforce the same trail, which in turn attracts more ants until the food is exhausted, after which the trail scent slowly dissipates. This behavior helps ants adapt to changes in their environment. When an established path to a food source is blocked by a new obstacle, the foragers leave the path to explore new routes. If successful, the returning ant leaves a new trail marking the shortest route. Since each ant prefers to follow a path richer in pheromone rather than poorer, the resulting route is also the shortest available. Ants make use of pheromones for other purposes as well. A crushed ant, for example, will emit an alarm pheromone, which in high concentration sends nearby ants into an attack frenzy; and in lower concentration, merely attracts them. To confuse their enemies, several ant species even employ "propaganda pheromones," which cause their enemies to fight among themselves (Wilson 1971). Like other insects, ants smell with their antennae, which are long and thin. These are fairly mobile, having a distinct elbow joint after an elongated first segment; and since they come in pairs—rather like binocular vision or stereophonic sound equipment—they provide information about direction as well as intensity. Pheromones are also exchanged as compounds mixed with food and passed in trophallaxis, giving the ants information about one another's health and nutrition. Ants can also detect what task group (e.g. foraging or nest maintenance) to which other ants belong. Of special note, the queen produces a certain pheromone without which the workers would begin raising new queens. Some ants produce sounds by their the gaster segments or mandibles coming together. Ants can detect sound vibrations that travel through the ground or other surfaces, but it is not certain if they can hear sounds that travel through the air. Sound messages are used to communicate information on food sources and dangers. In one experiment, ants trapped underground sent out vibrations and were rescued by ants on the surface who dug down to them (Milius 200). Ants attack others and defend themselves by biting, and in many species by stinging, often injecting chemicals like formic acid. Bullet ants (the genus Paraponera), found in Central and South America, are considered to have the most painful sting among insects. Although these are usually non-fatal; they are given the highest rating on the Schmidt Sting Pain Index, which measures the relative intensity of different insect stings. Jack jumper ants, Myrmecia pilosula, found in Australia have stings that cause fatality to a small number of people in the population, and cause hospitalizations each year (Clarke 1986). 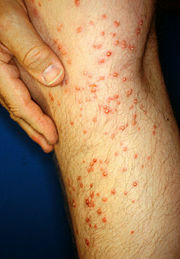 A vaccine based on use of the venom extract to develop immunity has been developed (Brown 2005). Some ants of the genus Odontomachus are equipped with mandibles called trap-jaws. This snap-jaw mechanism, or catapult mechanism, is possible because energy is stored in the large closing muscles. The blow is incredibly fast, about 0.5 ms in the genus Mystrium. Before the strike, the mandibles open wide and are locked in the open position by the labrum, which functions as a latch. The attack is triggered by stimulation of sensory hairs at the side of the mandibles. The mandibles are also able to function as a tool for more finely adjusted tasks. Two similar groups are Odontomachus and Dacetini—examples of convergent evolution. Apart from defense against larger threats, ants also need to defend their colonies against disease organisms. Some ant workers' role is to maintain the hygiene of the colony and their activities include undertaking or necrophory, the transport of dead nest-mates (Julian 1999). Oleic acid is identified as one compound released by dead ants that triggers undertaking behavior in Atta mexicana (López-riquelme 2006). Army ants and driver ants, from South America and Africa respectively, do not form permanent nests. Instead they alternate between nomadic stages and stages where the workers form a temporary nest (bivouac) out of their own bodies. Weaver ants (Oecophylla) build nests in trees by attaching leaves together, first pulling them together with bridges of workers and then sewing them together by pressing silk-producing larvae against them in alternation. An ant collects honeydew from an aphid. Leafcutter ants (Atta and Acromyrmex) feed exclusively on a special fungus that lives only within their colonies. They continually collect leaves, which they cut into tiny pieces for the fungus to grow on. There are different sized castes specially suited to finer and finer tasks of cutting and chewing the leaves and tending to the garden. Leaf cutter ants are sensitive enough to adapt to the fungi's reaction to different plant material, apparently detecting chemical signals from the fungus. If a particular type of leaf is toxic to the fungus, the colony will no longer collect it. The ants grow the fungus because it produces special structures called gongylidia, which are eaten by the ants. Aphids secrete a sweet liquid called honeydew, which they exude in the process of feeding from plants. The sugars can provide a high-energy food source, which many ant species collect. In some cases, the aphids secrete the honeydew specifically in response to the ants tapping them with their antennas. The ants in turn keep predators away and will move the aphids around to better feeding locations. Upon migrating to a new area, many colonies will take new aphids with them, to ensure that they have a supply of honeydew in the new area. Ants also tend mealybugs to harvest their honeydew. Myrmecophilous (ant-loving) caterpillars of the family Lycaenidae (e.g., blues, coppers, or hairstreaks) are herded by the ants, led to feeding areas in the daytime, and brought inside the ants' nest at night. The caterpillars have a gland that secretes honeydew when the ants massage them. Some caterpillars are known to produce vibrations and sounds that are sensed by the ants. Some caterpillars have evolved from being ant-loving to ant-eating and these myrmecophagous caterpillars secrete a pheromone which makes the ants think that the caterpillar's larva is one of their own. The larva will then be taken into the ants' nest where it can feed on the ant larvae. Worker ants generally do not grow wings and reproductive females remove theirs after their mating flights in order to begin their colonies. Therefore, unlike their wasp ancestors, most ants travel by walking. Some species of ants sometimes form chains to bridge gaps, whether that be over water, underground, or through spaces in arboreal paths. Some species also form floating rafts that help them survive floods. This may play a role in colonization of islands (Morrison 1998). Some ants are even capable of leaping. A particularly notable species is Jerdon's jumping ant, Harpegnathos saltator. This is achieved by synchronized action of the mid and hind pair of legs (Urbani 1994). Polyrhachis sokolova, a species of ant found in Australian mangrove swamps, can swim and lives in nests that are submerged underwater. They make use of trapped pockets of air in the submerged nests (Clay 1996). There are several species of gliding ant, including Cephalotes atratus. This may be a common trait among most arboreal ants. Ants with this ability are able to direct the direction of their descent while falling (Yanoviak 2005). Meat eater ants feeding on honey - social ants cooperate and collectively gather food. Not all ants have the same kind of societies. The Australian bulldog ants, Myrmecia pilosula, are among the biggest and most primitive of ants. The individual hunts alone, using its large eyes instead of its chemical senses to find prey. Like all ants they are social, but their social behavior is poorly developed compared to more advanced species. An Australian bulldog ant has only a single pair of chromosomes and males have just one chromosome as they are haploid. Some species of ants are known for attacking and taking over the colonies of other ant species. Others are less expansionist but nonetheless just as aggressive; they attack colonies to steal eggs or larvae, which they either eat or raise as workers/slaves. 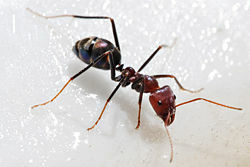 Some ants, such as the Amazon ants (Polyergus species), are incapable of feeding themselves, and must rely on captured worker ants to care for them. The pavement ant, Tetramorium caespitum, is famous for its urge to increase its territory. In early spring, colonies attempt to conquer new areas and often attack the nearest enemy colony. These result in huge sidewalk battles, sometimes leaving thousands of ants dead. Because of their aggressive nature, they often invade and colonize seemingly impenetrable areas. They are common in North America. Ants identify kin and nestmates through their scents, a hydrocarbon-laced secretion that coats their exoskeletons. If an ant is separated from its original colony, it will eventually lose the colony scent. Any ant that enters a colony with a different scent than that of the colony will be attacked (Henderson 2005). Ants taking apart a larger insect. Ants play a tremendously important role in the earth's natural ecosystems. They remove dead plants and animals and recycle their materials back into the soil. By digging their nests they loosen the soil and bring organic material underground, which enriches the soil and promotes the growth of plants. One study in the United States estimated that ants add one inch (1.5 cm) to the topsoil every 250 years (Wilson 1971). Some ants pollinate flowers as they feed on their nectar, and uneaten seeds left underground by ants are in an ideal situation to spout and grow. Some plants have an even closer symbiotic relationship with ants. The bullhorn acacia of Central America, Acacia cornigera, has hollow thorns that serve to house colonies of Aztec ants, Pseudomyrmex ferruginea, which defend the tree against other insects, browsing mammals, and epiphytic vines. In return, the ants obtain food from protein-lipid Beltian bodies, which the tree produces (Hoyt 1996). Many animals use ants as food. These include other insects, spiders, frogs, reptiles, birds, and mammals. Some species of mammals, such as anteaters, pangolins and several marsupial species in Australia, have special adaptations for living on a primary diet of ants. These adaptations include long sticky tongues to pick the ants and strong claws to break into the ant nests. The brown bear, Ursus arctos, one of the largest land mammals, often gets a significant portion of its nutrition by eating ants. Other animals take advantage of ants in other ways. In South and Central America, there are 28 species of antbirds, belonging to the family Formicariidae, that specialize in following army ant swarms and eating insects that are flushed out by the ants. They do not eat the ants themselves (Hoyt 1996). Thousands of species of arthropods (insects, spiders, mites, etc.) are found in close symbiotic relationships with ants. In some cases they prey on the ants or steal their food, in some cases they live on waste produced by ant colonies and do not benefit or harm the ants, and in some cases the relationship is beneficial to both. One of the strangest is the mite Macrocheles rettenmeyeri which lives on the foot of the army ant Euiton dulcius. It lives off of the blood of the ant and in return it serves as a extension of the ant's foot, using its legs in place of the ant's claws. Some beetles, as well as other insects, are social parasites, which in effect infiltrate ant society by tricking the ants into protecting them and giving them food. There are also ant species that are social parasites of other ants (Wilson 1971). The Formicidae family belongs to the order Hymenoptera, which also includes sawflies, bees, and wasps. Ants are a lineage derived from within the vespoid wasps. Phylogenetic analysis indicates that ants evolved from vespoids in the mid-Cretaceous period about 120 to 170 million years ago. After the rise of angiosperms about 100 million years ago, they increased in diversity and assumed ecological dominance about 60 million years ago. Several fossils from the Cretaceous are intermediate in form between wasps and ants, establishing further evidence for wasp ancestry. Like other Hymenoptera, the genetic system found in ants is haplodiploidy (Grimbaldi 2000; Moreau 2007; Wilson 2005). In 1966 Edward O. Wilson, who is considered to be one of the world's leading experts and researchers on ants, obtained the first amber fossil remains of an ant (Sphecomyrma freyi) from the Cretaceous era. The specimen was trapped in amber from New Jersey that was more than 80 million years old. This species provides the clearest evidence of a link between modern ants and non-social wasps. Cretaceous ants shared both wasp-like and modern ant-like characteristics (Wilson 1967). During the Cretaceous era, representatives of only a few species of primitive ants ranged widely on what was the super-continent Laurasia (the northern hemisphere). They were scarce in comparison to other insects (about only one percent). The ants became dominant in an adaptive radiation at the beginning of the Tertiary Period. Of the species extant in the Cretaceous and Eocene eras, only one of about ten genera is now extinct. 56 percent of the genera represented on the Baltic amber fossils (early Oligocene), and 96 percent of the genera represented in the Dominican amber fossils (apparently early Miocene) still survive today (Grimbaldi 2000). There is now great diversity among ants and their behaviors. They range in size from two to about 25 mm (about 0.08 to one inch). Their color may vary; most are red or black, but other colors can also be seen, including some tropical groups with a metallic luster. Numerous species of ant continue to be added in present times and taxonomic studies continue to resolve the classification and systematics of ants. Humans benefit greatly from the ants' role in helping to maintain the balance of nature. In addition ants may help keep potentially harmful insects, such as termites and agricultural pests, under control. The Masai of Africa had an abiding respect for the siafu ants, voracious predators that consume a large amount of insects and are welcomed for the benefit they bring to farmers, as they will eliminate all pests from a crop and quickly move on. The use of weaver ants in citrus cultivation in southern China is one of the oldest known uses of biological control (Holldobler 1990). In some cultures, ants are used as food and ingredients in traditional medicine. In some parts of the world large ants, especially army ants, are used as sutures by pressing the wound together and applying ants along it. The ant in defensive attitude seizes the edges in its mandibles and locks in place. The body is then cut off and the head and mandibles can remain in place, closing the wound (Gottrup 2004). The vast majority of ant species do no direct or indirect harm to humans. However, besides the painful bites and stings of some species, ants can harm human interests as agricultural pests. Insect tending species, such as the Argentine ant (Linepithema humile), which has spread to North America and Europe with human help, and the fungus cultivating leafcutter ants can be especially damaging to crops. In rare cases, death may result from allegeric reaction to ant stings. Carpenter ants, Camponotus species, burrow into dead wood and sometimes damage wooden buildings. Humans have contributed to ant problems by spreading some species from their natural habitats to other continents and to islands. The Invasive Species Specialist Group lists 16 ant species as harmful invasive species. Among the problems mentioned are destruction of native species of ants and other insects, harm to plant species that depend on native ants for pollination and seed dispersal, damage to crops, bites and stings, and possible spread of disease organisms to hospitalized patients (ISSG 2007). Although most of the species of ants seen in homes do very little harm, modern society often considers the ant a pest. Due to the adaptive nature of ant colonies, eliminating them is nearly impossible. Pest control with regard to ants is more a matter of controlling local populations than eliminating an entire colony. Attempts to control ant populations of any kind are temporary solutions. Typical ants that are classified as pests include pavement ants (otherwise known as the sugar ant), Pharaoh ants, carpenter ants, Argentine ants, and the red imported fire ant. Control of species populations are usually done with bait insecticides, which are either in the form of small granules, or as a sticky liquid that is gathered by the ants as food and then brought back to the nest where the poison is inadvertently spread to other members of the brood—a system that can severely reduce the numbers in a colony if used properly. Boric acid and borax are often used as insecticides that are relatively safe for humans. With the recent insurgence of the red imported fire ant, a tactic called broadcast baiting has been employed, by which the substance (usually a granule bait designed specifically for fire ants) is spread across a large area, such as a lawn, in order to control populations. Nests may be destroyed by tracing the ants' trails back to the nest, then pouring boiling water into it to kill the queen. Aesop's ants. Picture by Milo Winter, 1888-1956. Traditional cultures often had a great respect for ants. In parts of Africa, they are said to be the messengers of the gods. Some Native American religions, such as Hopi mythology, recognize ants as the very first animals. The Japanese word for ant, ari, is represented by an ideograph formed of the character for insect combined with the character signifying moral rectitude, propriety (giri). So the Chinese character could possibly be read as The Propriety-Insect. Its actual etymology is likely to be different, however (Hearn 1904). In the Book of Proverbs in the Bible ants are held up as a good example for humans for their hard work and cooperation. 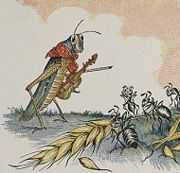 Aesop did the same in his fable "The Grasshopper and the Ants." Mark Twain wrote about ants in his A Tramp Abroad. Some modern authors have used the example of the ants to comment on the relationship between society and the individual. Examples are Robert Frost in his poem "Departmental" and T. H. White in his fantasy novel The Once and Future King (Harris 1999). Ants have been used as the inspiration for science fiction races, as in Robert Heinlein's Starship Troopers and Orson Scott Card's Ender's Game. These races are often referenced as having a hive mind, a common misconception about ant colonies, and benefit from uncommon unity of focus and a willingness for the individual to give its life for the good of the hive. Ants also appear in comic strips such as Johnny Hart's B. C. and animated movies such as Antz and A Bug's Life, where they serve to make fun of human society. Brown, S. G., M. D. Wiese, K. E. Blackman, and R. J. Heddle. 2005. "Efficacy of ant venom immunotherapy and whole body extracts." Journal of Allergy and Clinical Immunology 116(2). Clark, P. 1986. The natural history of sensitivity to jack jumper ants (hymenoptera:formicidae:Myrmecia pilosula) in Tasmania. Medical Journal of Australia 145: 564-566. Clay, R., and A. Andersen. 1996. "Ant fauna of a mangrove community in the Australian seasonal tropics, with particular reference to zonation." Australian Journal of Zoology 44: 521–533. Fukushi, T. 2001. "Homing in wood ants, Formica japonica: use of the skyline panorama". The Journal of Experimental Biology. Retrieved October 5, 2007. Gordon, D. 1999. Ants at Work. New York: The Free Press. ISBN 0684857332. Gottrup, F., and D. Leaper. 2004. "Wound healing: historical aspects". EWMA Journal 4(2). Retrieved November 3, 2007. Grimaldi, D., and D. Agosti. 2000. A formicine in New Jersey Cretaceous amber (Hymenoptera: Formicidae) and early evolution of the ants. Proceedings of the National Academy of Sciences of the United States of America. Retrieved September 30, 2007. Harris, S. 1999. A few thoughts on the dead ant heap and our mechanical society. Alcor.org. Retrieved October 13, 2007. Hearn, L. Kwaidan: Japanese stories and studies of strange things. World Wide School Library. Retrieved October 13, 2007. Henderson, G., J. F. Anderson, J. K. Phillips, and R. L. Jeanne. 2005. "Internest aggression and identification of possible nestmate discrimination pheromones in polygynous ant Formica montana." Journal of Chemical Ecology 16(7): 2217-2228. Hölldobler, B., and E. Wilson. 1990. The Ants. Boston, MA: Harvard University Press. ISBN 0674040759. Hoyt, E. 1996. The Earth Dwellers: Adventures in the Land of Ants. New York: Simon & Schuster. ISBN 0684810867. Invasive Species Specialist Group (ISSG). 2007. Ants. Invasive Species Specialist Group Website. Retrieved October 13, 2007. Jones, A. 2007. Did you know?. Nationalgeographic.com. Retrieved September 30, 2007. Julian G. E., and S. Cahan. 1999. "Undertaking specialization in the desert leaf-cutter ant Acromyrmex versicolor." Animal Behavior 58(2): 437-442. Krushelnycky, P. 2005. Hawaii ants. Antweb.org. Retrieved September 30, 2007. López-riquelme, G., E. A. Malo, L. Cruz-lópez, and M. L. Fanjul-Moles. 2006. "Antennal olfactory sensitivity in response to task-related odors of three castes of the ant." Atta mexicana (hymenoptera: formicidae). Physiological Entomology 31: 353–360. Milius, S. 2000. When ants squeak. Science News Online. Retrieved October 5, 2007. Moreau, C., et al. 2006. Phylogeny of the ants: Diversification in the age of angiosperms. Science. Retrieved September 30, 2007. Morrison, L. 1998. "A review of Bahamian ant (Hymenoptera: Formicidae) biogeography." Journal of Biogeography 25(3): 561-571. Schultz, T. 2000. In search of ant ancestors. Proceedings of the National Academy of Sciences of the United States of America. Retrieved September 30, 2007. Urbani, C. B., G. S. Boyan, A. Blarer, J. Billen, and T. M. Musthak Ali. 1994. "A novel mechanism for jumping in the Indian ant Harpegnathos saltator (Jerdon) (Formicidae, Ponerinae)." Experientia 50: 63-71. Wilson, E., F. M. Carpenter, and W. L. Brown. 1967. The first Mesozoic ants. Science 157: 1038-1040. Retrieved September 30, 2007. Wilson, E. 1971. The Insect Societies. Cambridge, Massachusetts: The Belknap Press of Harvard University Press. ISBN 0674454901. Wilson, E. and Holldobler, H. 2005. "The rise of the ants: A phylogenetic and ecological explanation". Proc. Nat. Acad. Sci. 10221): 7411–7414. Retrieved September 30, 2007. Yanoviak, S. P., R. Dudley, and M. Kaspari. 2005. "Directed aerial descent in canopy ants." Nature 433: 624-626. This page was last modified on 2 April 2008, at 02:20.